Many photography books advise you to carefully compose a scene in your mind, and then carry out that vision with your equipment. However, I don’t do it that way! When I go out looking for stunning Smoky Mountains photos and hope to find a candidate to add to my Gallery, I’m usually gathering hundreds of photographic pieces for later evaluation. Surrounded by beauty such as you see on this page, it’s quite overwhelming. There are photos every way you turn! My strategy is to get into the moment, really feel it, not think it. 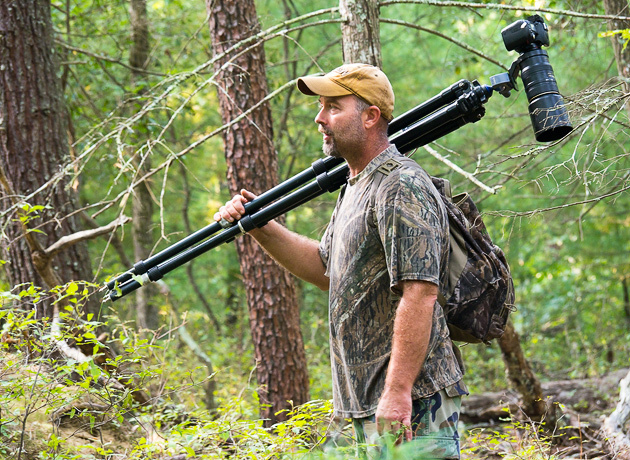 Let the camera roam around and find what it likes. Sometimes it will be weeks later before I get around to sorting and evaluating. The two photos here are good examples of how I work to create a best-selling photograph from all the pieces that were gathered before. The image below is quite nice. 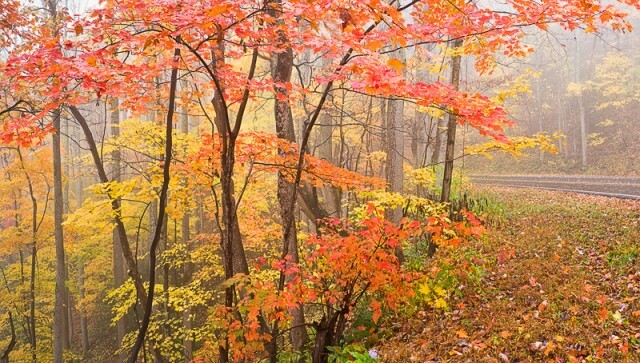 Gorgeous autumn leaves on a foggy day, with a road in the scene. But it doesn’t rise to the level that is required to really touch the patrons of my Gallery enough to want it hanging in their home. The image above is just a short rotation to the left of the one below. 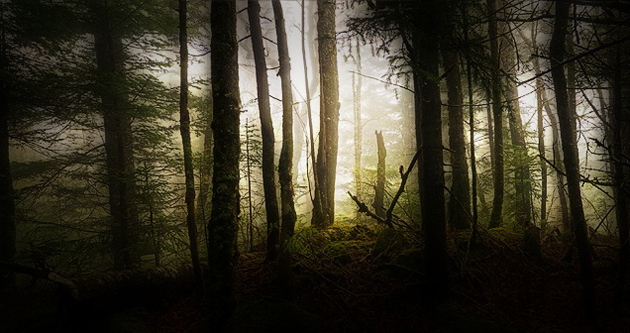 The road has disappeared, and the woods have become isolated and prominent. 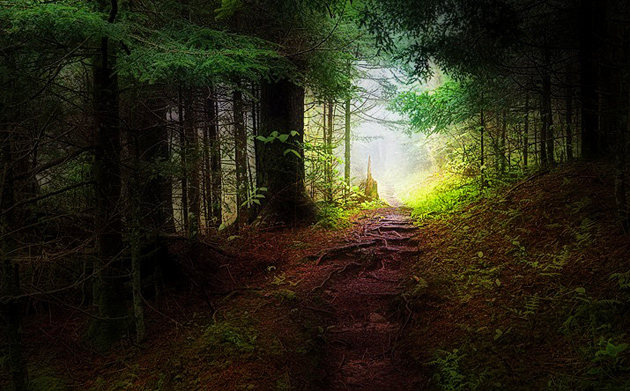 Without the road and the short grass as reference points, the scene has become grander, and more mysterious. 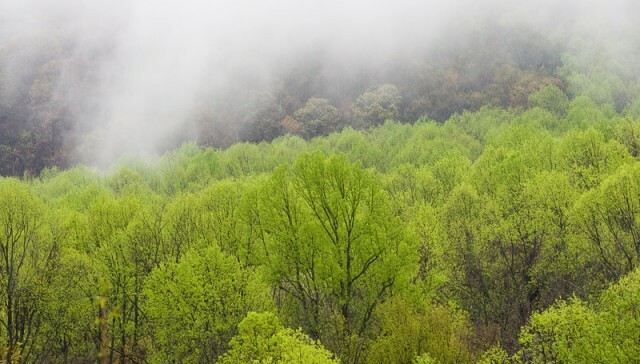 There are layers of color and contrast which are enhanced by the fog. There is so much going on in foreground and distance that your mind gets caught up examining the scene, and while doing that you begin to feel the emotions that come along with those details. I’m always drawn to images that have layers of detail near and far. With my printing techniques, these images often take on a three-dimensional quality. The image above is a candidate, and will be printed in a few sizes to see how customers react. Sometimes the mood of an image strikes a universal chord in people, and they respond. 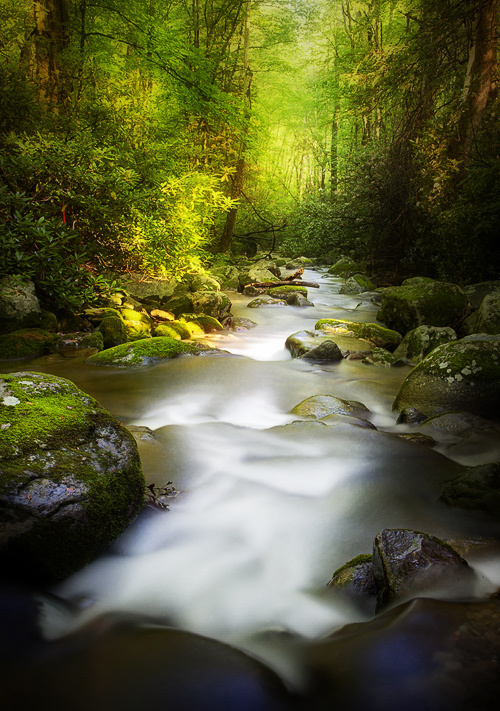 If you’re visiting the Smokies, please stop in to see this image and my complete display of Smoky Mountains photos at the William Britten Gallery along the historic Arts and Crafts Trail along Glades Rd. in Gatlinburg. 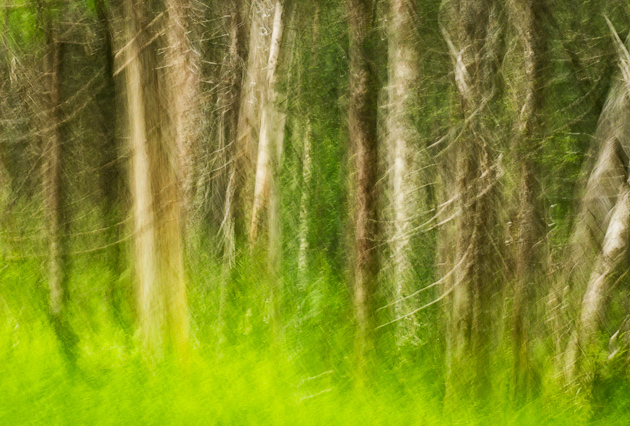 In the middle of a hot summer, I can get restless, and feeling a bit confined within the boundaries of “normal” images. 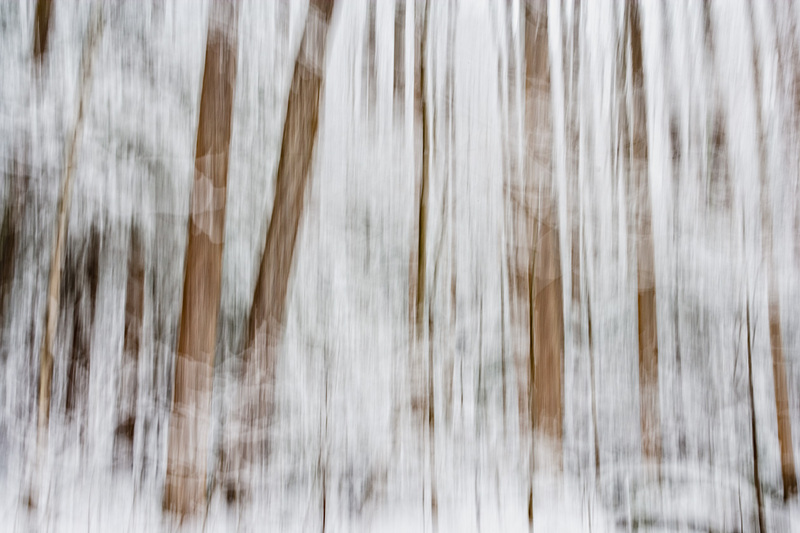 I start to think “outside the camera.” For example, a few weeks ago I wrote a post about camera movement during long exposures to create photographic Impressionism. 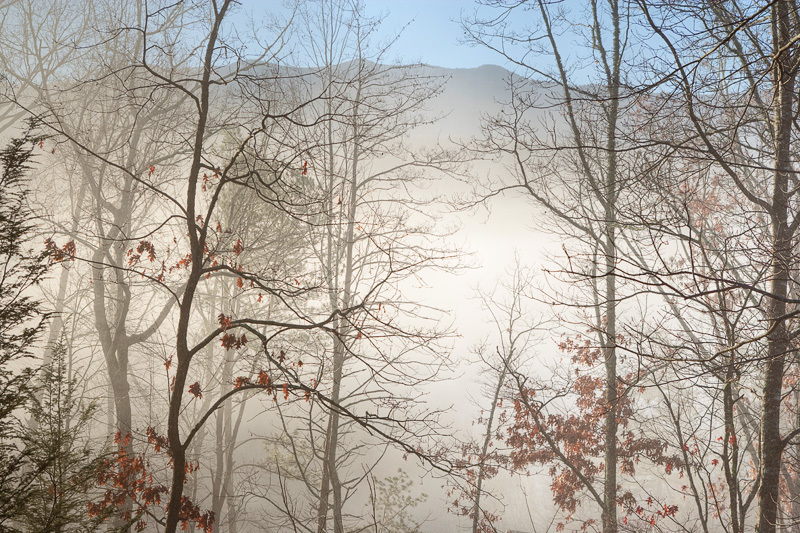 Today’s Smoky Mountains photos have a bit of the surreal, a dash of a midnight memory or dream with a dollop of daylight’s bright colors. It’s like filling in the blanks of your memory along the border between the dream and the wakeful daytime. Of course the Light and the Dark are the two realms we know, and to mix them together can stir up feelings. What do the images suggest to you or make you feel? 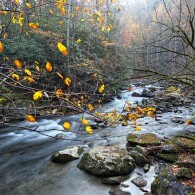 The photos on this page were taken in the area of the Smoky Mountains known as the Roaring Fork. This is a beautiful area, and somewhat mysterious under any conditions, especially with those green boulders strewn down the stream bed. These pictures are more experiments with long exposures. It’s early in the morning along the dark creeks, and the day is not nearly as bright as the photos make it seem. The exposure times are in the area of 30 seconds, which adds another dash of the surreal with the extreme flow of the whitewater. When your dreams finally clear, please consider a stop at the William Britten Gallery along the historic Arts and Crafts Trail on Glades Rd. in Gatlinburg. 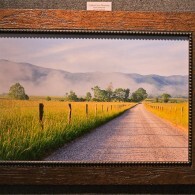 My complete display of Smoky Mountains Photos might tempt you with a special memory to take home with you. I think fog gets a bad name. It’s typically about what fog can obscure: living life in a fog, the fog of war, the fog of depression. Well, like our neighbor over in the mountains of western North Carolina, Carl Sandburg, I think fog has delightful qualities. 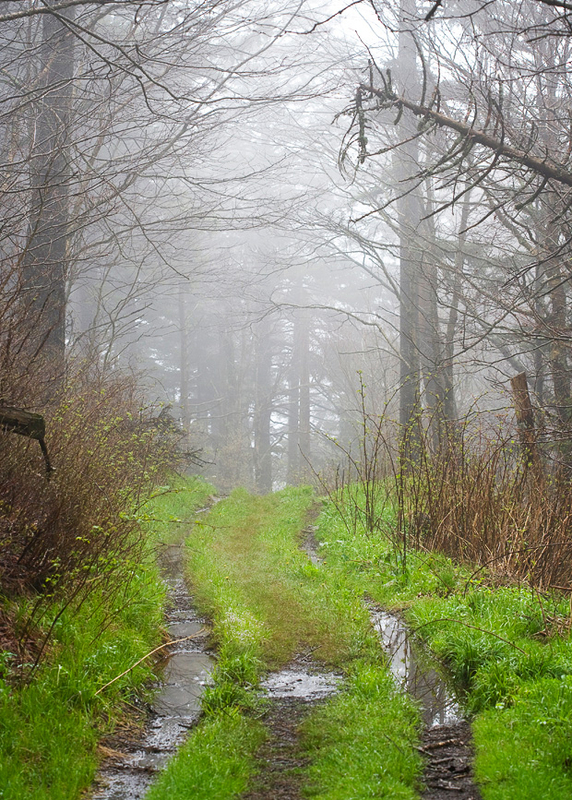 For example, in the picture above, a dash of fog can actually be a clarifying factor for the beautiful muddy road in the foreground. For the photo below, it’s the opposite, with the fog in the foreground, giving a nice contrast to the clarity of Mt. LeConte, rising above the fog. It’s that time of year … Is it winter? Is it spring? 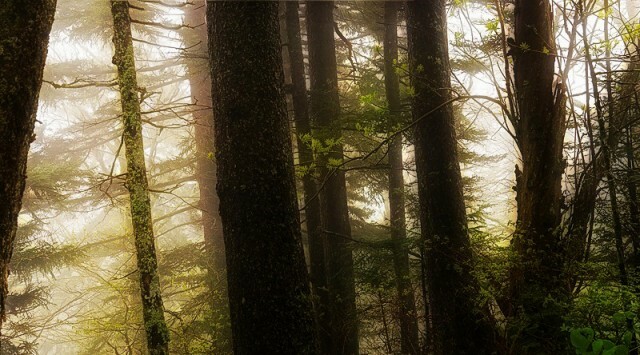 … warm and cold and damp … welcoming conditions for fog. 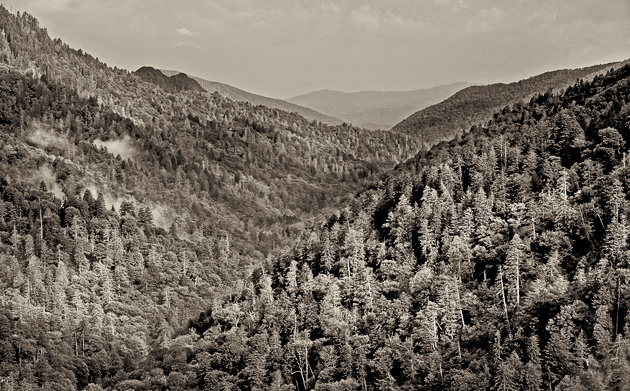 These three Smoky Mtns photos illustrate something about how the process of photography happens for me. 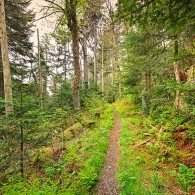 All were taken on a high-elevation trail near Clingmans Dome in the Smokies. Walking along the trail, the scene above caused me to stop. Something about the elements brought on an emotional response, which is what I am usually looking for in order to create a good photograph. 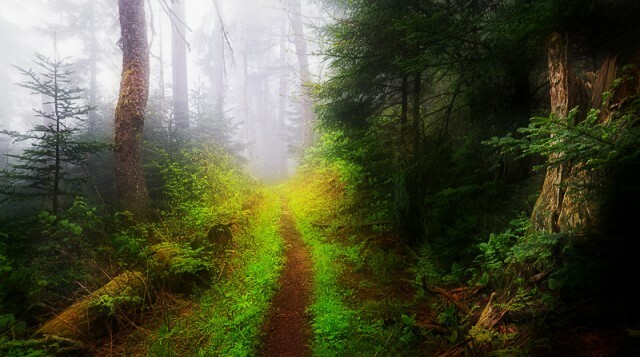 The well-worn path leads off into the distance of a foggy morning. The ferns are soft and welcoming – a nice contrast with the mystery of the trail. Then there’s that big old stump on the right, which will be a very nice frame for that side of the image. Finally, there are some spindly pine trees to the left, offering a frame for that side. I set up the tripod and composed the photograph above. It’s nice, but not tight enough. Too many loose distractions, which will dilute the emotional response. 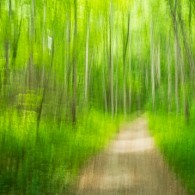 The image below is another interpretation of the foggy trail scene. Obviously it is very different from the one above. It stretches the emotions of the scene to an almost surreal degree. The fog-shrouded trail is very mysterious, the path is very bright, and the stump on the right has become a bit sinister. The whole scene is Hobbit-like. These two images show how a finished photograph is an interpretation, and just as a musical score can be interpreted in different ways, so can a photographic image. Perhaps the most frequent question that I am asked is “was this really the way it looked, or have you enhanced it?” The answer to both parts of that question is yes … it really did look this way, but a good photograph will take it much further than simply recording a time and place. 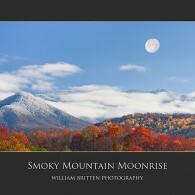 Please stop and see my complete collection of Smoky Mtns photos at the William Britten Gallery. 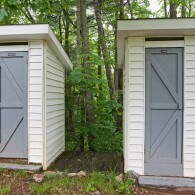 I’m located along the historical Arts and Crafts Trail on Glades Rd. in Gatlinburg, TN. Click on any of these pictures to see a larger version. 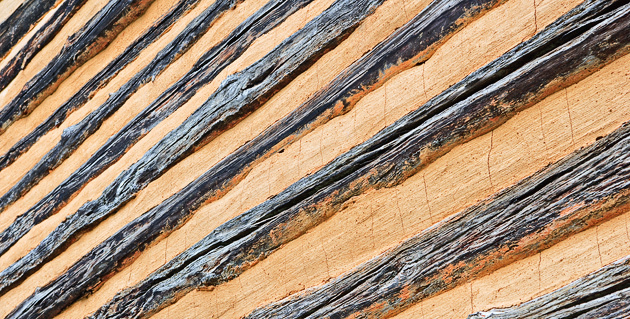 The textures in these photos of aged wood are a thing of beauty. 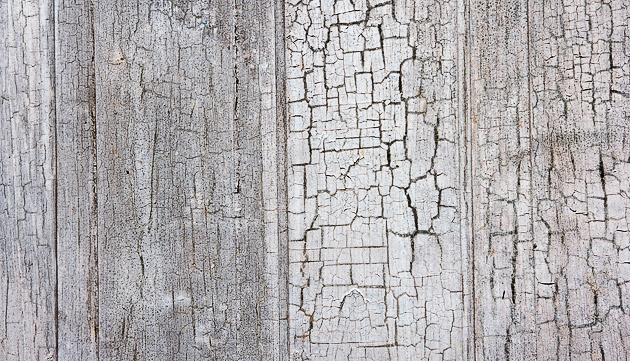 The cracks and weathering only add character. 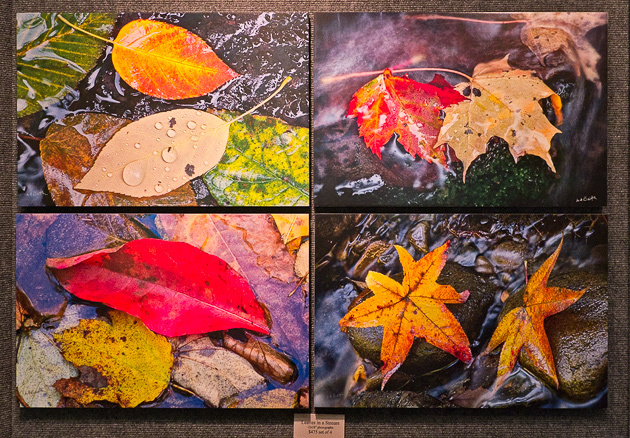 All three of these photos are in the Smoky Mtns. The top and bottom pictures were found in Cades Cove, and the one below is from a door in one of the old cabins along “Millionaire’s Row” in Elkmont. 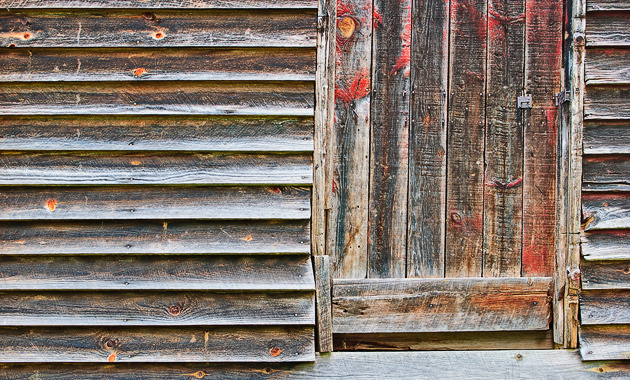 There are many old structures in the Smokies that bear witness to the passage of time. 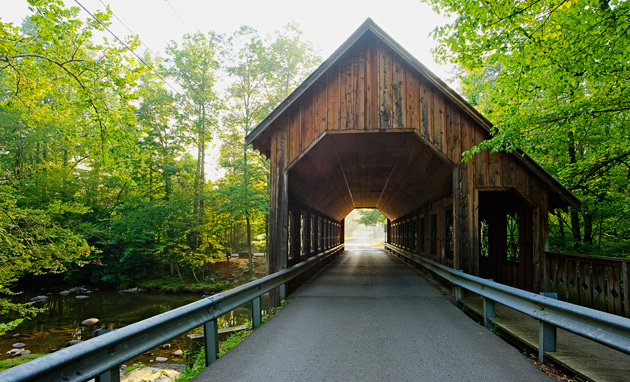 Cades Cove has perhaps the largest collection, but there are also many along the Roaring Fork, and over in Cataloochee, as well as other areas. 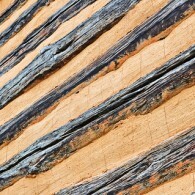 It’s fun to stop and look closely at the old wood. 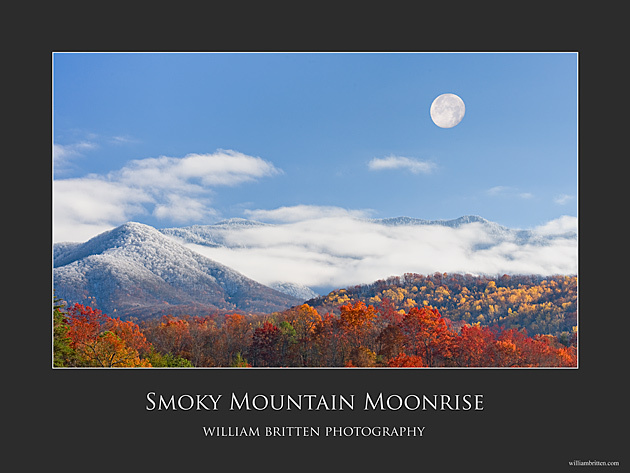 If you’re vacationing in the Smokies, please consider a stop at the William Britten Gallery, where you’ll find the complete display of Smoky Mtns photos, plus magnets, mugs and notecards of Smokies scenes. 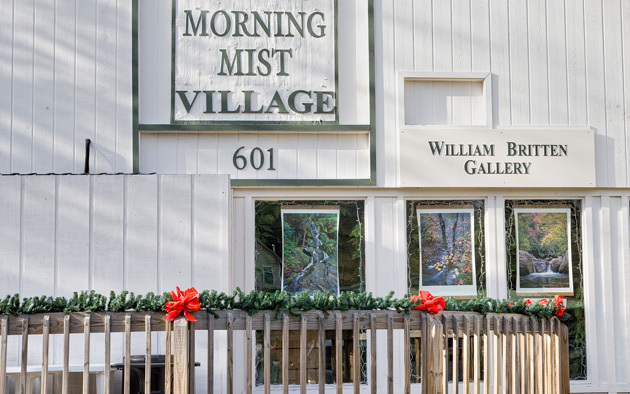 The Gallery is located in Morning Mist Village, along the historic Arts and Crafts Trail on Glades Rd. in Gatlinburg. 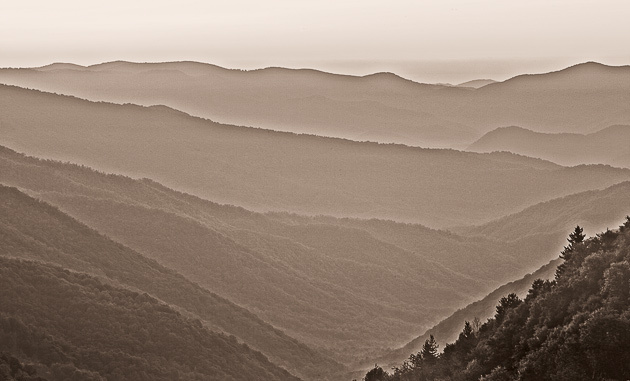 Smoky Mountains photos need not always be in color, as these three vistas illustrate. The photo above is the classic shot from Mortons Overlook near the top of Newfound Gap Rd. Looking down the valley back towards Gatlinburg, with the Chimneys visible in the upper left. A nice mist rising up the hillsides. 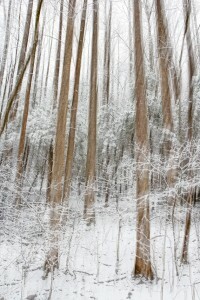 The photo below is from the Oconaluftee Overlook just below Newfound Gap on the North Carolina side. This is a monochrome version of my popular photo, Listening to Silence. The final image below was taken from about 10 miles away, on a ridge above Upper Middle Creek Rd. It’s a head-on view of the north face of Mt. 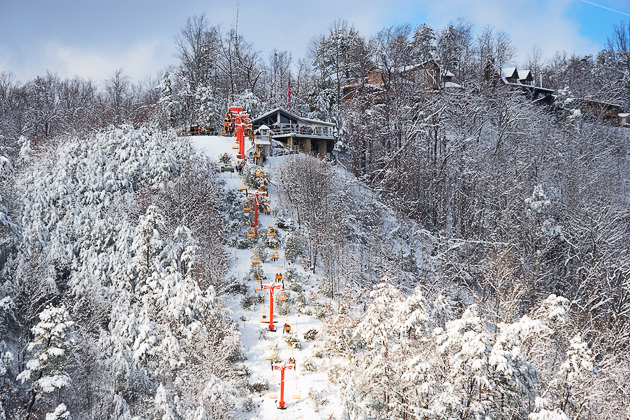 LeConte after a winter storm. 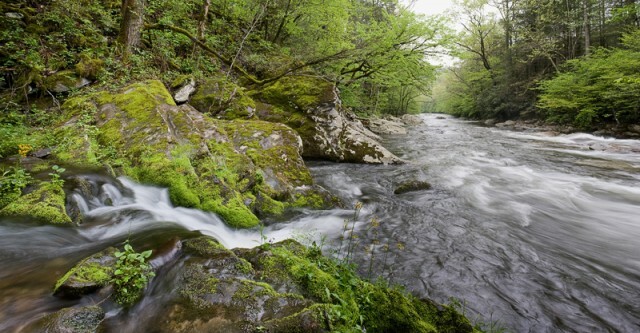 If you’re in the Smokies for a visit, please stop in to see the complete display of Smoky Mountains photos at the William Britten Gallery on the historic Arts and Crafts Trail along Glades Rd. in Gatlinburg, TN. 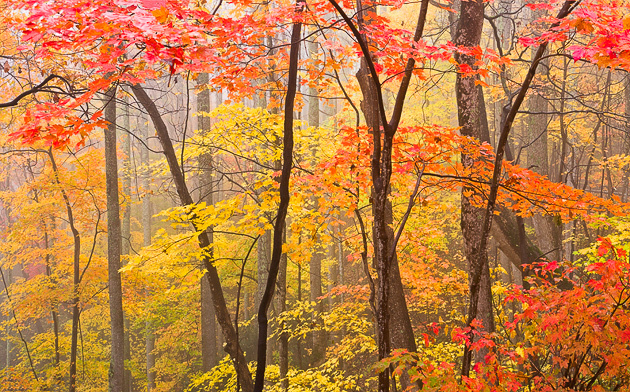 There’s plenty of color on the gallery walls, and there may be a special Smoky Mountains memory waiting for you! I’ve been neglecting the blog lately. It’s the busiest time of year … something like a marathon run for Sarah and me. 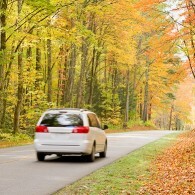 This is the month that draws by far the most visitors to the Smokies. For us it means our Gallery is open seven days a week, while we also have a booth seven days a week at the Craftsmens Fair in the Gatlinburg Convention Center. 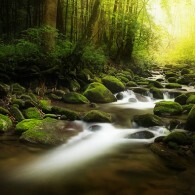 Many visitors will stop in at both locations to see my Smoky Mountains photos. I sure appreciate that! 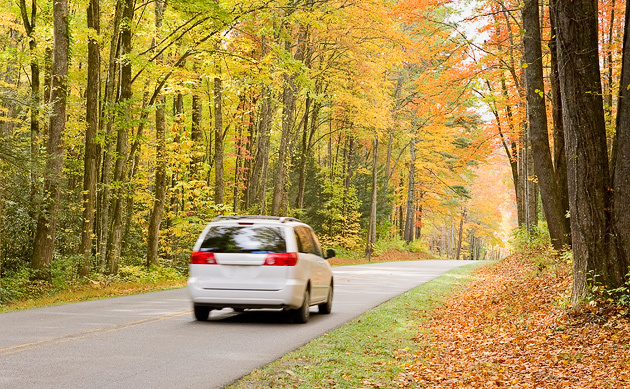 The fall leaves are nearing their peak display at the higher elevations and will soon offer glorious autumn landscapes all over the National Park. Somehow I have to find the time to sneak out and not miss all of this color! 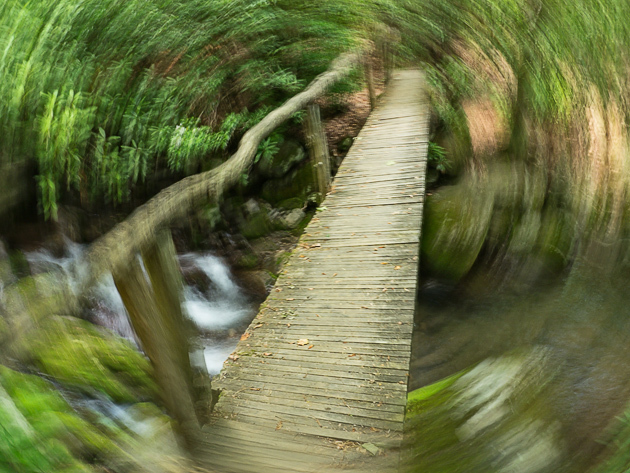 So if you see a madman rushing around with a tripod early in the morning, or waiting for the sunset on Clingman’s Dome, that might be me! As always, I’d love for you to stop and say hello at the William Britten Gallery along the historic Arts and Crafts Trail on Glades Rd in Gatlinburg. And until October 23rd I’ll also be at my usual location at the bottom of the escalator, near the entrance to the Craftsmens Fair. 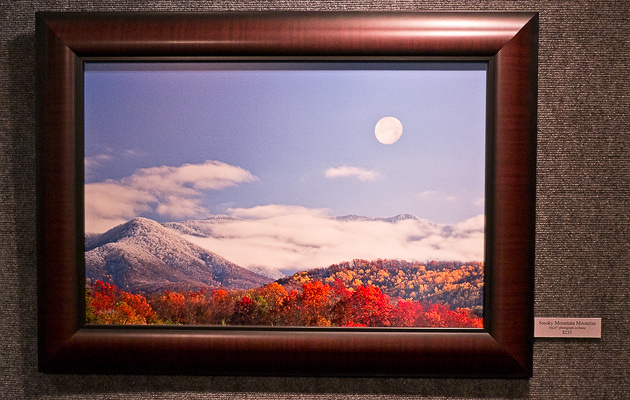 I’ve got lots of beautiful autumn Smoky Mountains photos on display, as well as all of the other seasons. Photographs like you have Never Seen Before! Each image is printed in my studio using the latest archival inks on premium photographic paper. The colors are rated to last over 75 years without fading. Once the inks are dry, I coat the surface of the print with an art-grade laminate. I have a machine that does this, and applying the coating is a craft in itself! This surface coating protects the photo. It also pops out the colors. 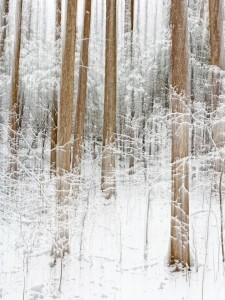 The coating gives the image a greater sense of depth. This is part of what creates the dimensional effect that so many people comment on. 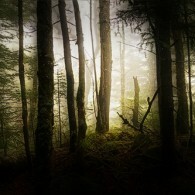 The photos on this page are three of my most popular images. 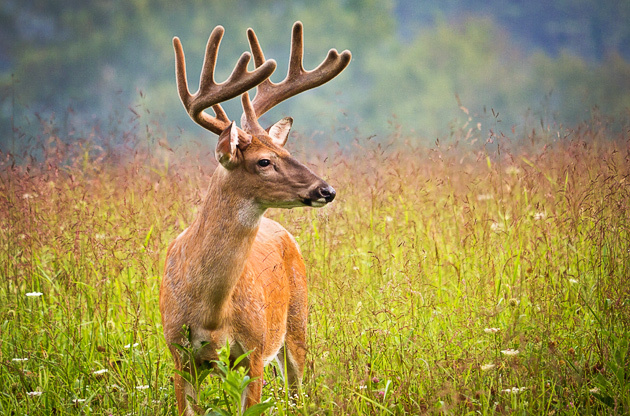 At the top of the page is Cades Cove Morning, which depicts a glorious start to the day in one of the most popular locations in the Smoky Mountains. Above is Smoky Mountains Moonrise, which captures a stunning late-fall evening with snow already fallen on the higher elevations. And below is my signature piece, the Leaf Set, depicting birch, maple, sweet gum, and sourwood leaves fallen to the ground. This set of four images is mounted on thick boards to be hung without frames. Please come on out to the Arts and Crafts Trail on Glades Road in Gatlinburg and stop in for a visit at the William Britten Gallery. 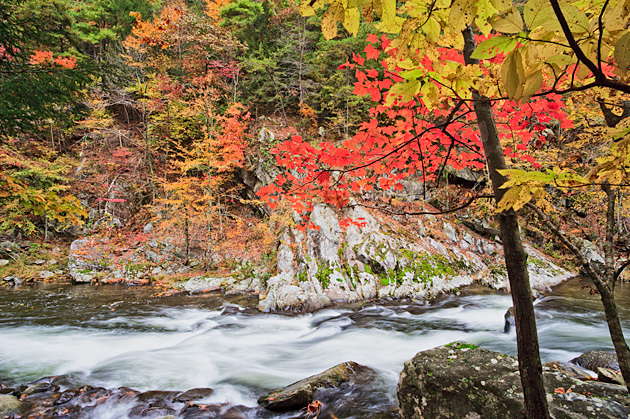 My complete display of Smoky Mountains photos, including all of my Featured Photos, will tempt you with a special memory to take home. 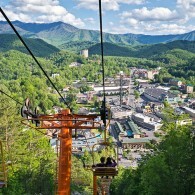 Try the Sky Lift for Great Smoky Mountains Photos! 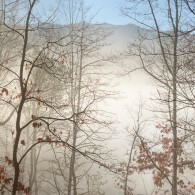 The Sky Lift in downtown Gatlinburg (near stoplight #8) offers great opportunities for dramatic Smoky Mountains photos. 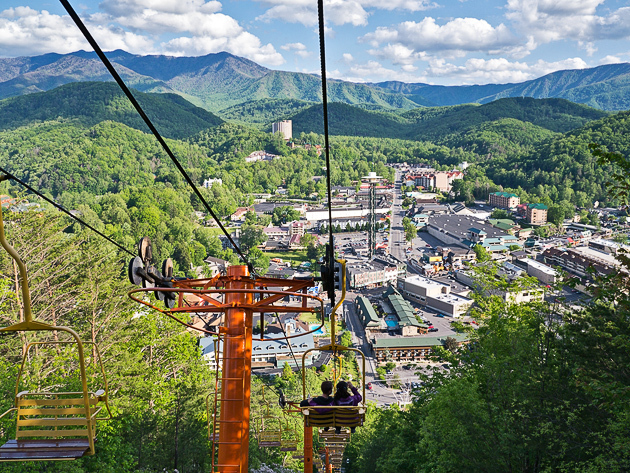 The ride itself is a fun activity, but the vistas of the mountains and the town of Gatlinburg are fabulous! 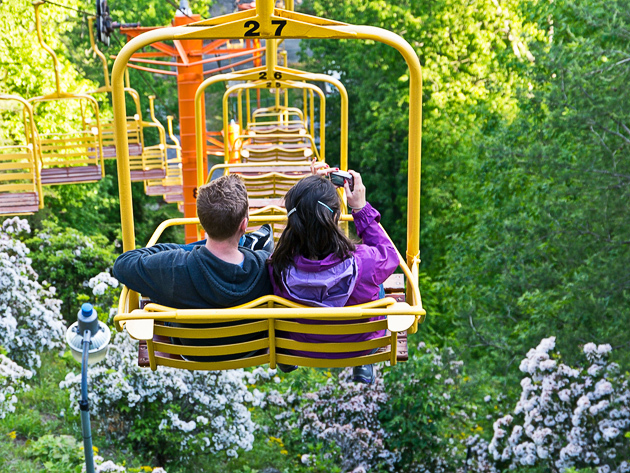 The photos above and below are examples of what you can see from a chair on the Sky Lift. The ride is open until after dark, so you can get some wonderful sunset and night shots of the town and the Smoky Mountains. The photos below show the ride in May with the Mountain Laurel blooming all over the hillside of Crockett Mountain, and at the bottom of the page is a sunny day after a winter storm. 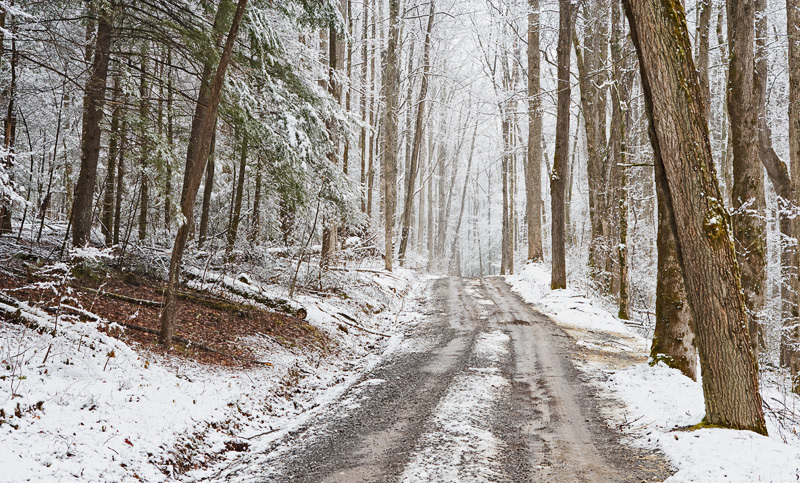 In winter there are incredible photo possibilities, but the ride is not always open. 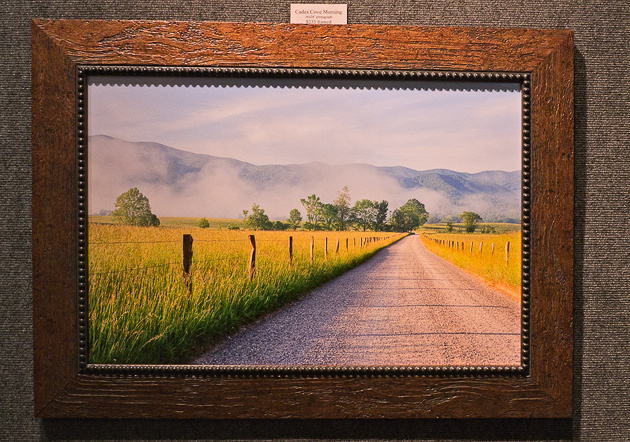 For a full display of Smoky Mountains photos please stop by the William Britten Gallery on Glades Rd in the historic Arts and Crafts district. 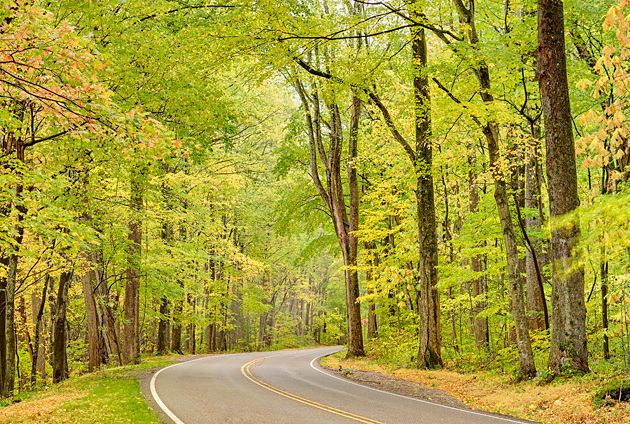 There’s a Smoky Mountains memory waiting to ride home with you! 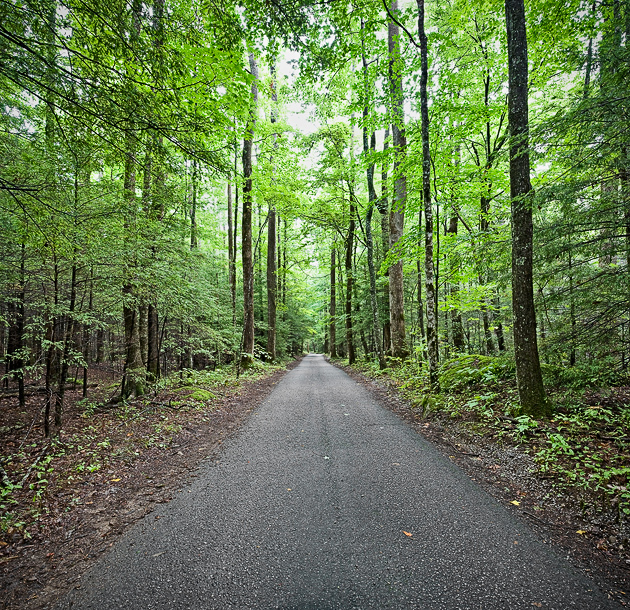 Roaring Fork Motor Trail Opens for the Season Today! 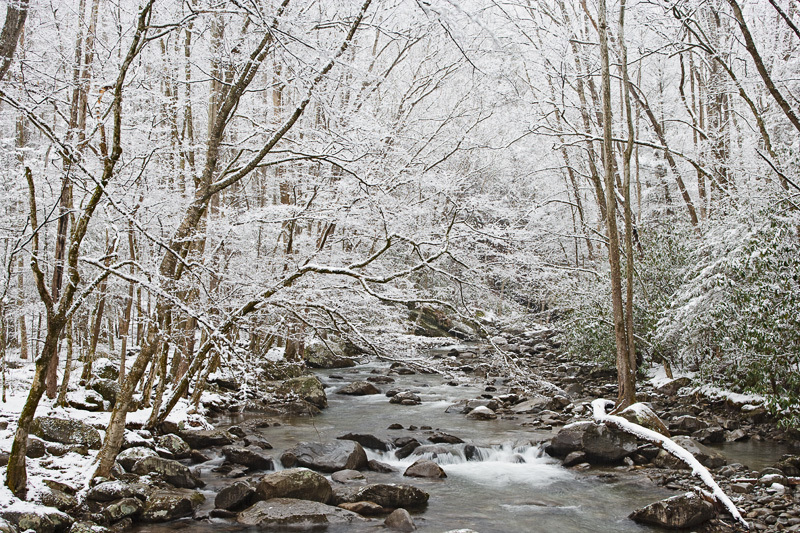 One of my favorite places in the Smoky Mountains opens today after the annual winter closure. 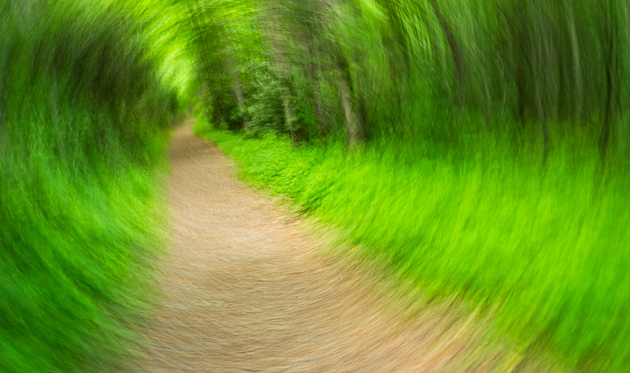 The Roaring Fork Motor Nature Trail is a goldmine for pictures. Pioneer homesteads, amazing moss-covered boulders, waterfalls, and trails. 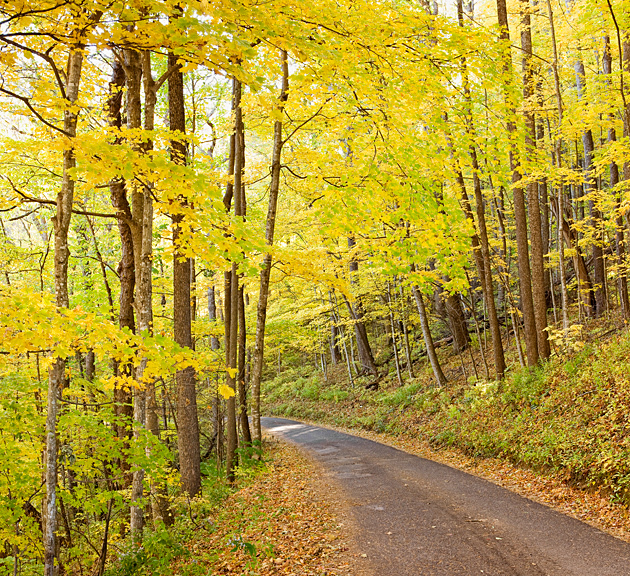 On a typical year, I will go around the Roaring Fork a dozen or fifteen times, watching the seasons change along this familiar route. One of my most popular waterfall pictures, Place of 1000 Drips, can be found right beside the road near the end of the 5 mile motor trail. One of the best trails in the Smoky Mountains is also along the one-way loop. 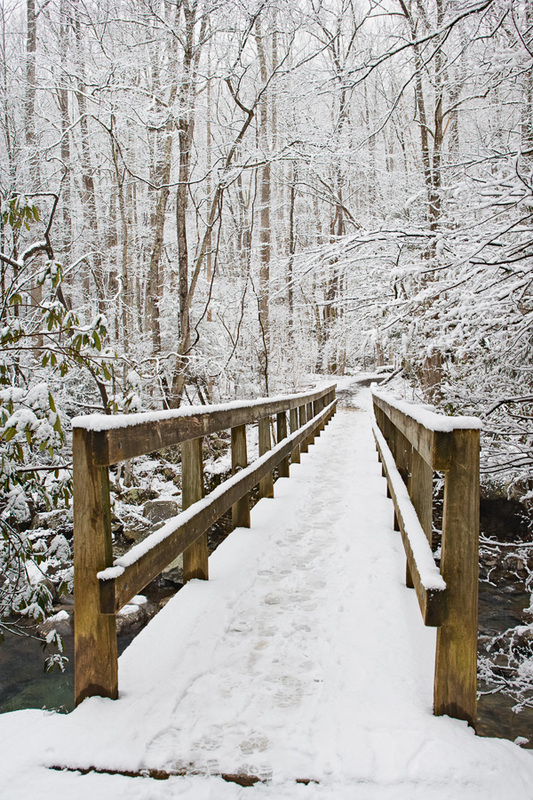 I last hiked the trail to Grotto Falls in late November, just before the Roaring Fork was closed for the winter. If you’re lucky, you might take a picture of the famous Smoky Mountains llamas ferrying supplies up to LeConte Lodge. 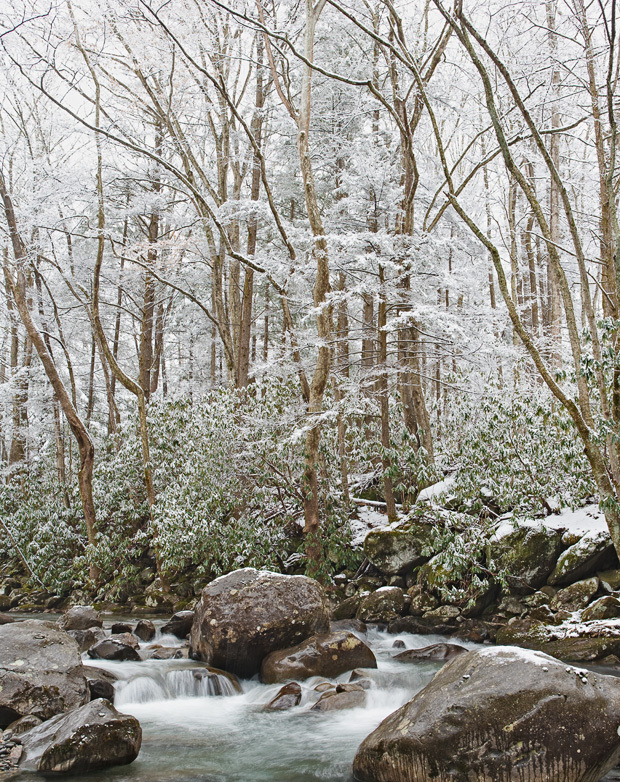 The Roaring Fork also features one of the best displays of Mountain Laurel to be found in the Smoky Mountains. It’s at the top of a hill, beside one of the pull-offs to the right. The large and thick grove of laurel bushes is most amazing if you get out and walk inside it. The laurel usually bloom in the second week of May. A few weeks before this, you will see lots of Trillium and other wildflowers. And don’t forget the dogwood bloom in mid-April! At the end of the ride, you’ll exit onto Rt. 321. Take a right turn, and head out to Glades Rd. Turn left on Glades, go a mile or so, and look for the Morning Mist Village shops. 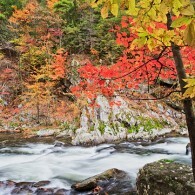 If you got this far, please stop in at the William Britten Gallery to see my complete display of pictures from the Smokies. And If you are a Facebook user, you can get my daily Smoky Mountains news and photos by becoming a fan of the William Britten Photography Facebook Page. I’ve been working on a couple of poster designs for the coming year. Have never done a poster before … since there will be a print run of 1000 copies, I’ll start with just these two. Of course the actual posters won’t have the white border like these blog images. What do you think? I’d appreciate any feedback. Happy Friday everyone! I recently took a break from our craft fair and stopped in at the Gatlinburg Festival of Trees, at the Mills Center just after Thanksgiving. 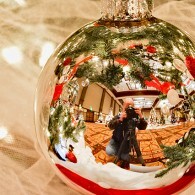 In the picture above you might be able to see my reflection in the ornament, with the trees all around me. Very M.C. Escher, isn’t it? 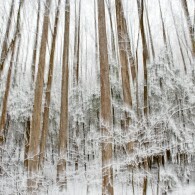 In my photography I seem to be drawn to worlds within the world, the miniature landscapes that might go unnoticed. 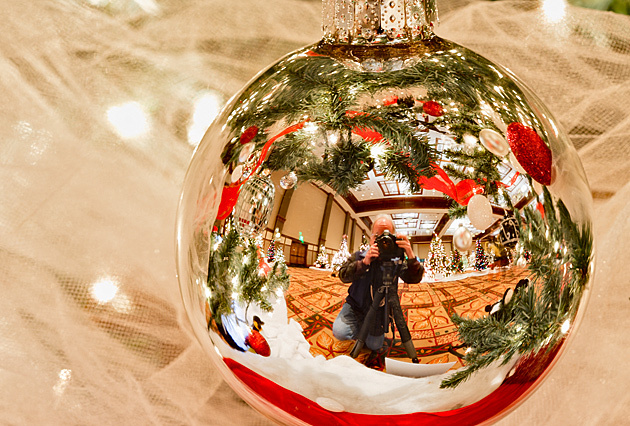 As I roamed around the Festival Of Trees, the sponsors of the event became curious, and asked me several times what I was doing. They encouraged everyone to photograph the trees, but I was down on my knees, zeroed in on something that caught my eye, never took a single photo of an entire tree! It intrigues me to think about what a small segment will look like if it is presented as the entire world. It’s December in Gatlinburg, and the Smoky Mountains are looking somewhat cold and barren. 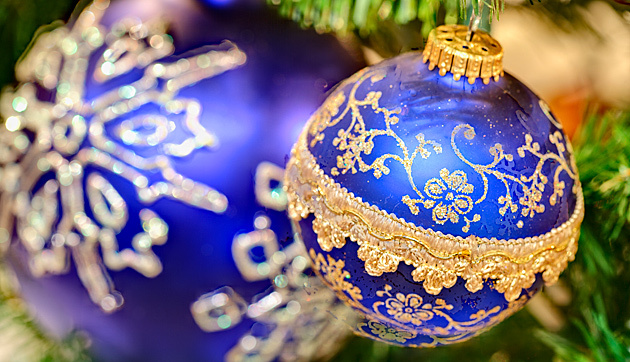 So we turn our attention to the sparkle and lights of the Christmas season. More on that in the days to come …. 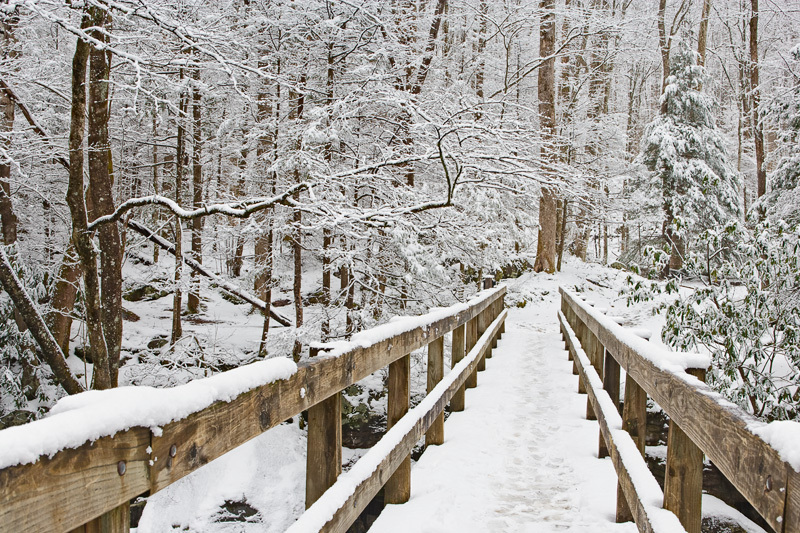 It’s a wonderful time to visit the Smokies. 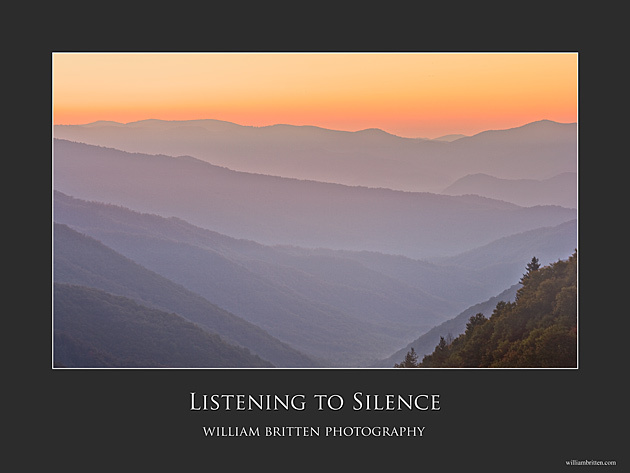 If you can get away, please stop in and visit me to see the complete display of Smoky Mountain Photography at the William Britten Gallery out on Glades Rd. along the Arts and Crafts Trail. I love this time of year. I think of it as “echoes of autumn.” The trees are nearly bare, but still there are a few leaves hanging on to add just an accent of color to the scene. 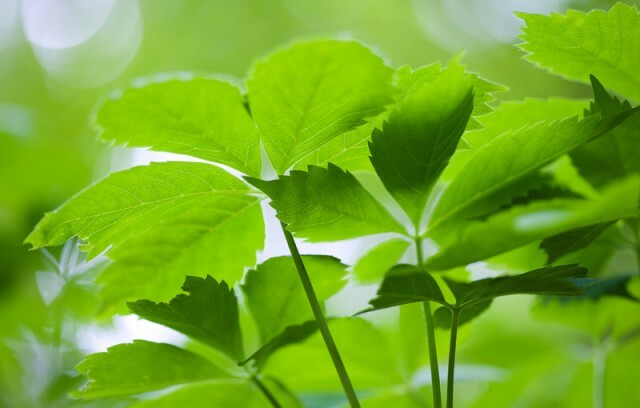 In its own way it is as charming and attractive as the main leaf season. 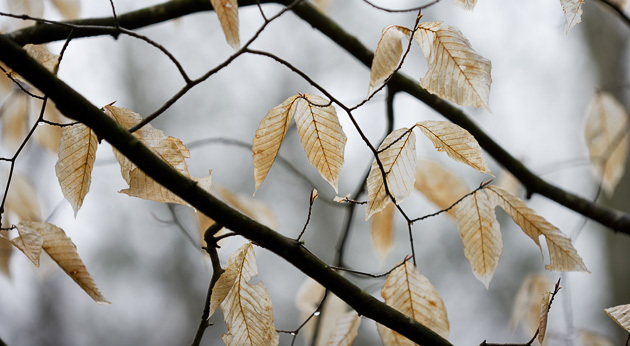 In part, the beauty of the “Echoes” season comes from all the leaves that are now on the ground. Add the element of water and you have the makings of a very attractive scene. 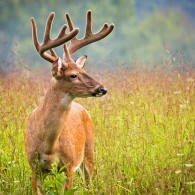 Which leads me to ponder the nature of beauty in nature. It’s true that the leaves at their October peak are spectacularly beautiful. But the day pictured here has some more subtle features that add together to make beauty also. Many visitors to my Gallery on a day like this would comment, saying something like “it’s a rainy day and the leaves are gone … I guess we really picked a bad time to come.” In reply, I point to many pictures on the gallery walls that celebrate just such a day! 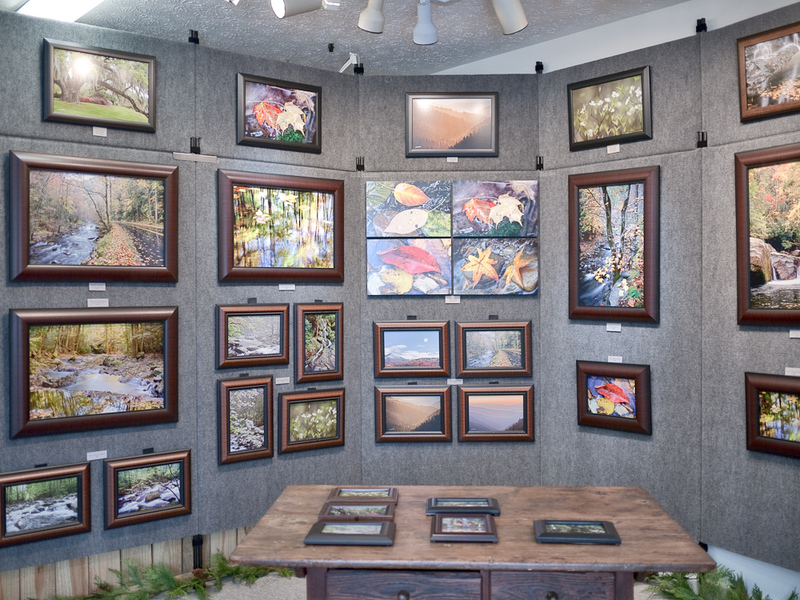 Rain or shine, please stop in and visit me to see the complete display of Smoky Mountain Photography at the William Britten Gallery in Gatlinburg, TN. 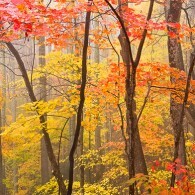 Are we tired of these glorious autumn scenes? It will soon be over, but for now the feast for the eyes continues! 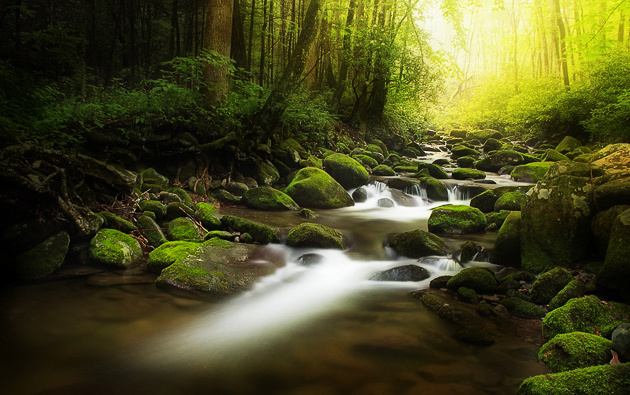 This one is along the Little River in the Great Smoky Mountains, between Metcalf Bottoms and Tremont. And from the same area, the pleasing reflections below. 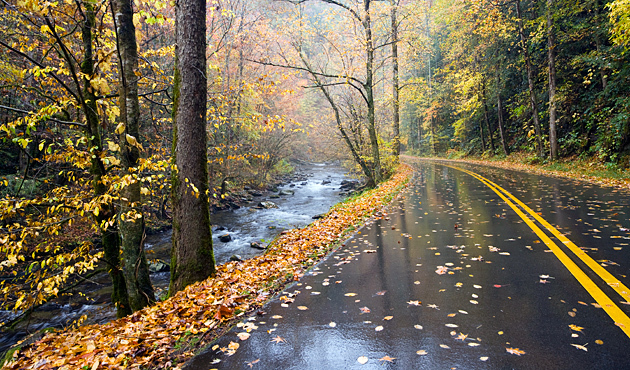 If you grow weary of driving the autumn roads in the Smokies, please stop in and visit me to see the complete display of Smoky Mountain Photography at the William Britten Gallery in Gatlinburg, TN. 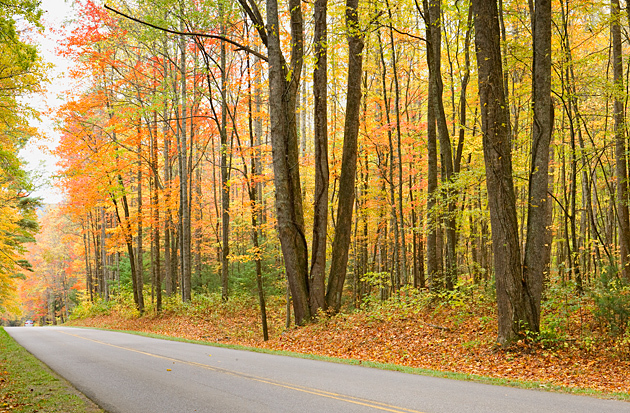 Can’t get enough of the autumn roads in the Great Smoky Mountains National Park. 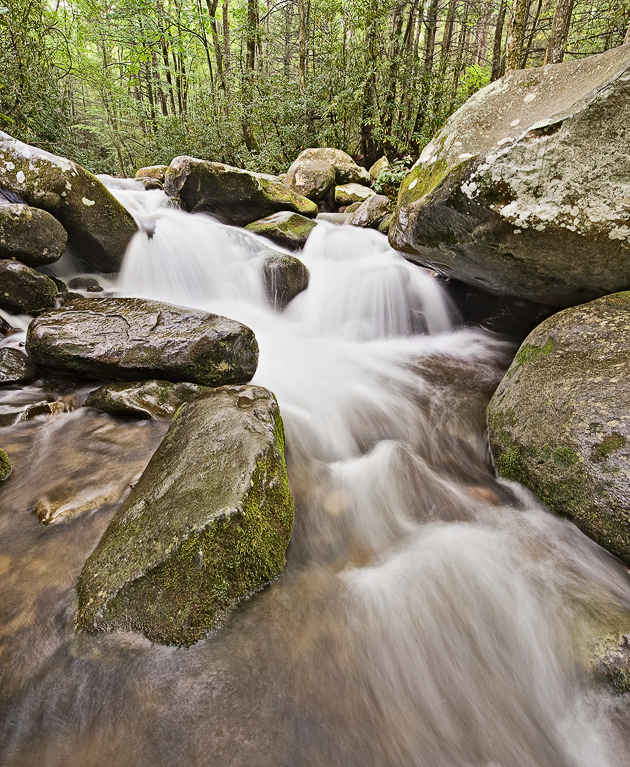 The above scene was along the Roaring Fork Motor Trail just outside Gatlinburg. 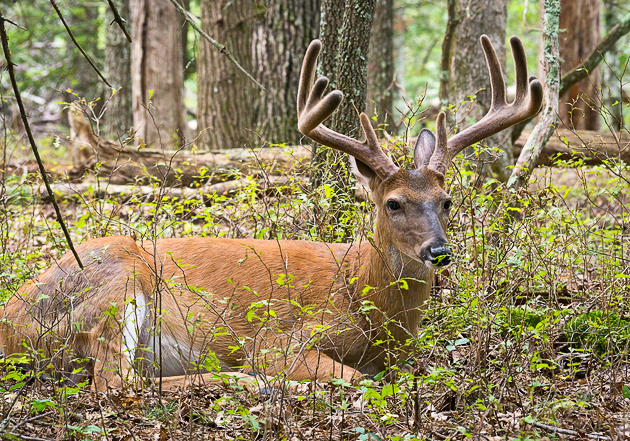 The one below is along the Little River Road between the Sugarlands Visitor Center and Cades Cove, just past the Laurel Falls parking area. 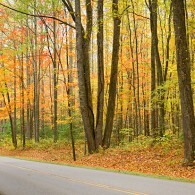 I love the way the autumn yellows accentuate the remaining summer greens. 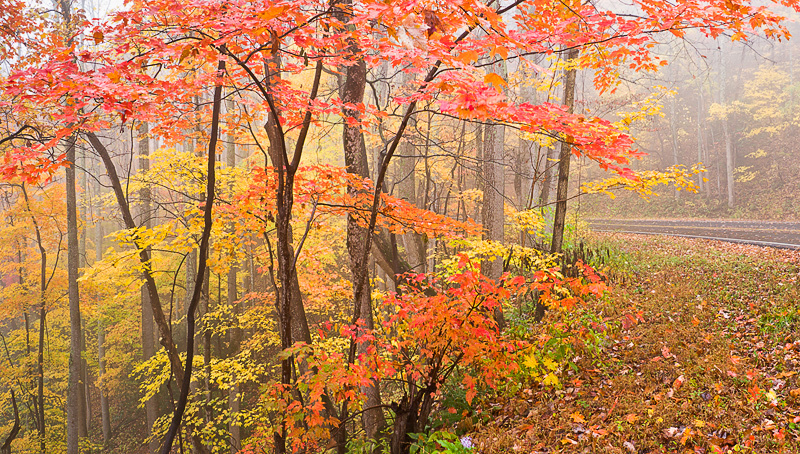 Below is a beautiful cocoon of color along the Newfound Gap Road. And one more bonus shot, again along the Little River Road. This picture holds a special place in my heart. 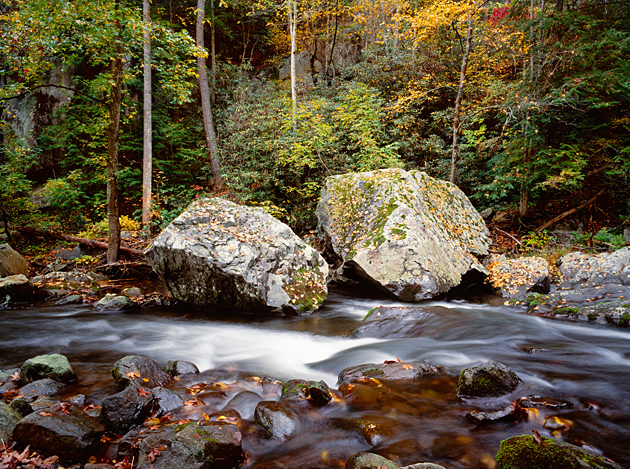 In 2002 I began to think about Smoky Mountain photography as a serious endeavor, and Twin Boulders was one of the very first images that I printed in a large size. 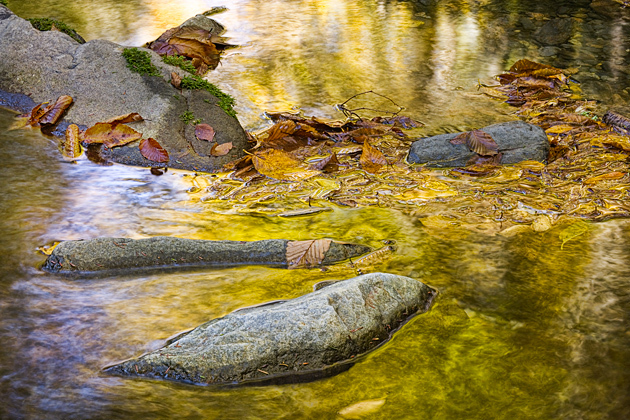 I was very proud of it — the flowing water was captured just right, and the clarity and detail was astounding. This image could be enlarged to 3 feet by 4 feet without loosing its punch. Although the subject matter is fairly average, the “wow factor” of a large print of Twin Boulders convinced me that I could take my photography to another level. 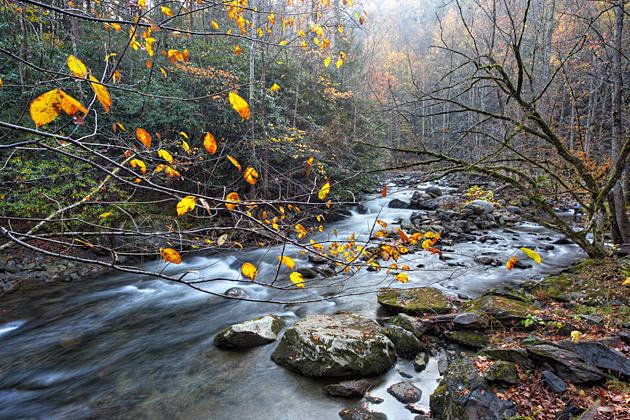 The scene is along the Middle Prong of the Little River, in the Tremont section of the Great Smoky Mountains National Park. I spent a lot of time up in Tremont since it was the closest entrance to the Smokies from my home in Knoxville at the time. Honestly, I didn’t imagine at the time that the path would lead to a life in Gatlinburg, and the William Britten Gallery in the Arts and Crafts area on Glades Rd. 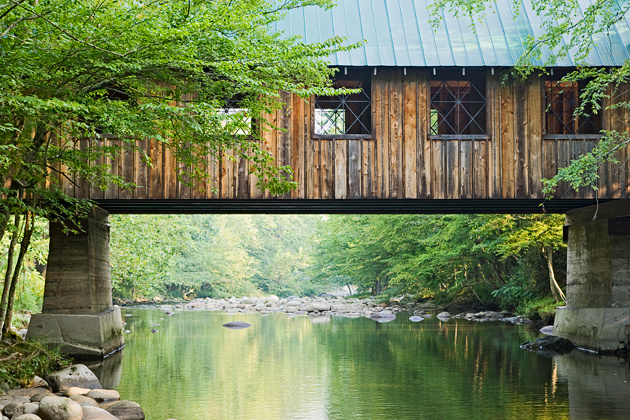 The Smoky Mountain area is not known for its covered bridges. This one was built fairly recently. 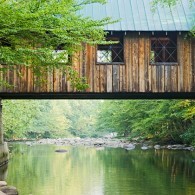 The bridge spans the Little Pigeon River just downstream from where it runs out of the Park in the Greenbrier section. It’s a nice, peaceful spot for swimming or fishing. 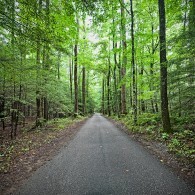 You can find it by taking the road just opposite the Greenbrier entrance to the Great Smoky Mountains National Park. 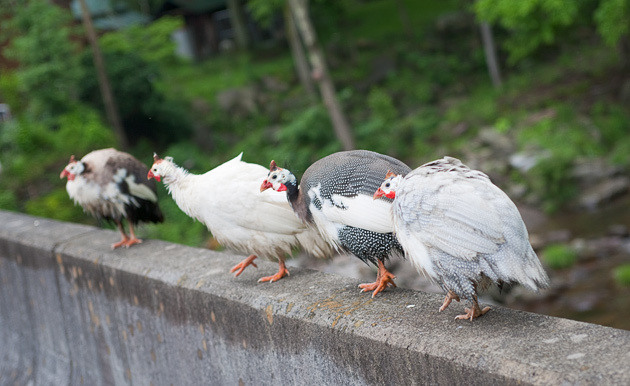 The guinea hens above were relaxing on a bridge just outside the Big Creek entrance to the Great Smoky Mountains National Park. I stopped to take their picture, and listening to their distinctive guinea hen cackling, I remembered raising some of these crazy birds back in the 1970s. 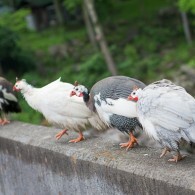 I had a farm in West Virginia, and was given a batch of cute little guinea hen chicks. They were adorable at that stage of life, and I trained them to sit on my shoulders … sometimes one on each side. Of course eventually they grew up to be dirty and noisy, and big and heavy. The problem was, they still liked to fly up and roost on my shoulders. Ouch! 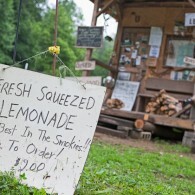 Best Lemonade in the Smokies! 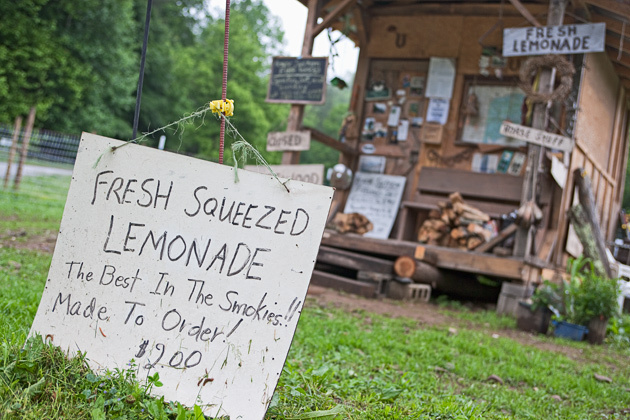 Here’s a tip for those hot summer days touring around the Great Smoky Mountains National Park: the best lemonade is over in Mt. Sterling near the entrance to the Big Creek section of the Park. It’s a bit of an effort to get to this lemonade stand, but it could be worth it, especially if you go on into Big Creek and hike the trail up to Midnight Hole. Head out of Gatlinburg going east on Rt. 321. Continue to Cosby, turning right at the stop sign. Keep on going, past the Cosby entrance to the Park. 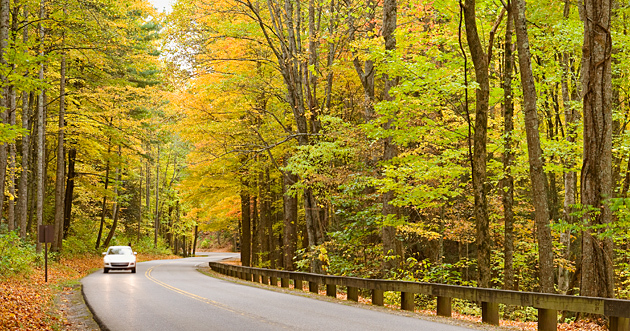 You will wander for about 15 miles on a curvy mountain road, eventually coming to a four-way intersection. Look to the left, and there’s your lemonade stand. 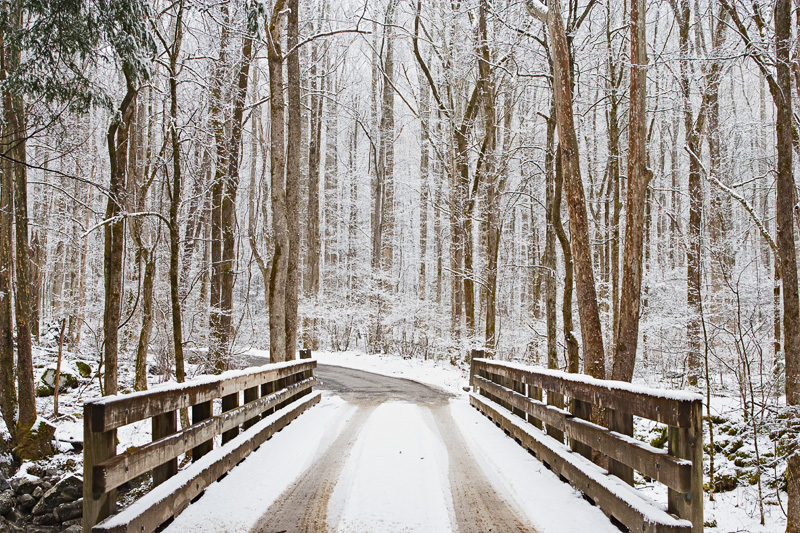 To your right is the Big Creek entrance to the Smokies. 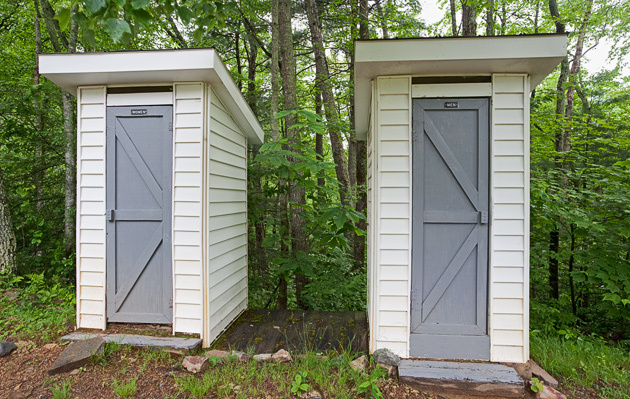 If you are ever traveling on NC Route 284 between Cosby, TN, and the Cataloochee Valley in the Great Smoky Mountains, you might find yourself in need of a rest stop. Now this is a fine gravel highway with some excellent gift shops along the way (see below). If you watch for the sign pointing off towards the Mt. Sterling Baptist Church, there awaits you a comfort station with facilities for both men and women. 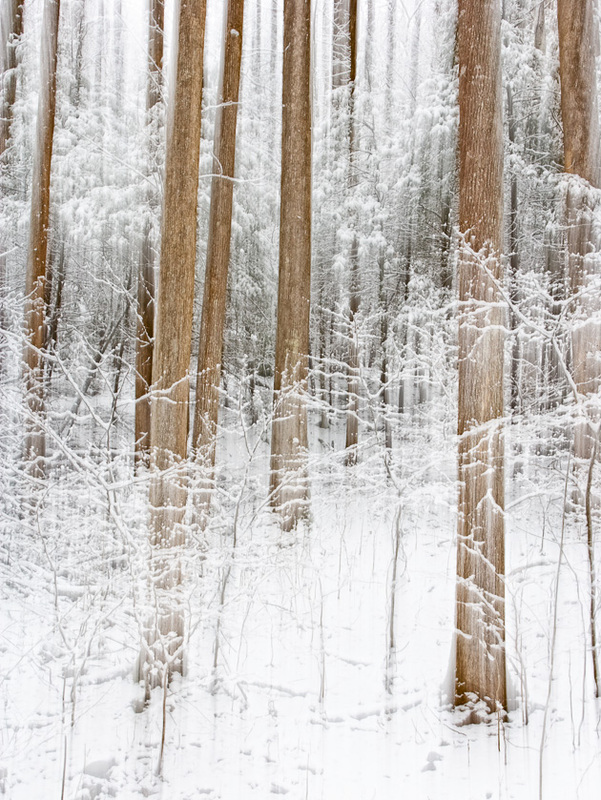 Perhaps the last decent snowfall of the winter this week created a winter dreamscape up in the Greenbrier section of the Great Smoky Mountains National Park. These pictures tell the whole story. Click on the first one to bring up a larger slide show, then put your mouse over the image to go forward or back. 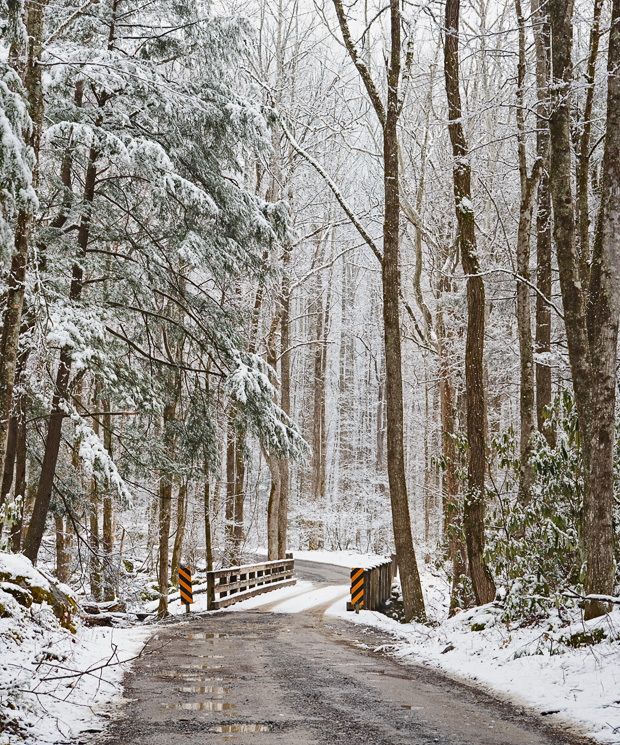 Another light snowstorm through most of the day yesterday, but not enough to close the entrance to the Great Smoky Mountains National Park. 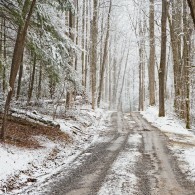 I drove up into the Greenbrier section and found a winter fairyland. 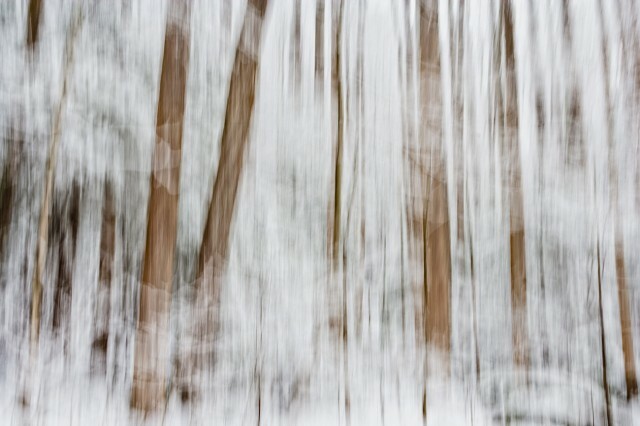 So beautiful and dreamlike … I’ll have some more images soon from my roamings, but first a few abstract treatments. The mood of these tall trees along the Ramsay Cascades Trail was like a ghostly cathedral. I was trying to capture the peace and silence, and the white glow around the whole scene. 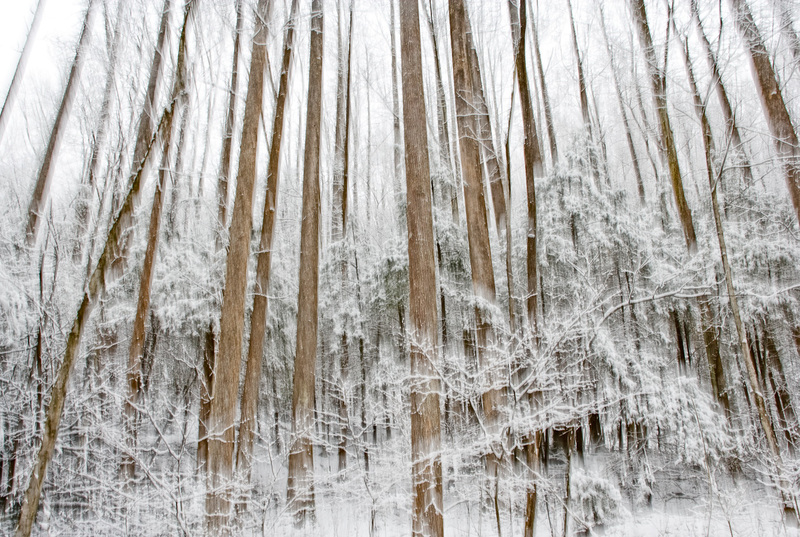 With all those upright tree trunks, I couldn’t resist the temptation to set the up for a long exposure and wave the camera vertically as the picture was taken. 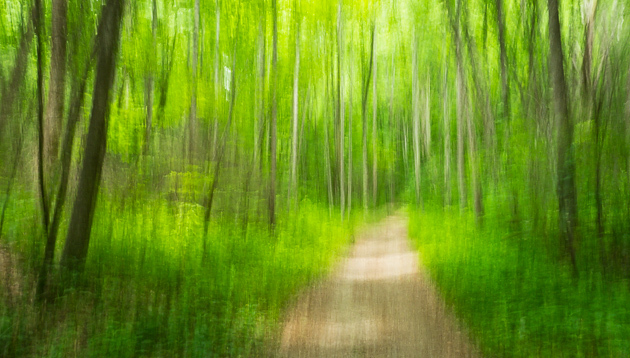 It takes a bunch of attempts to get something good, but the idea is with about a one second exposure to hesitate for about half that time and let the scene be captured with some amount of detail, then quickly move the camera up or down to create the dreamy, blurry, ghostly effect. Not a Photoshop trick, all done in the camera! Here are some more from this series. Click any one to bring up a slide show, then hover your mouse over the image to go forward or back in the series. The finishing touches are done, the sign put up, and the welcome mat put down. 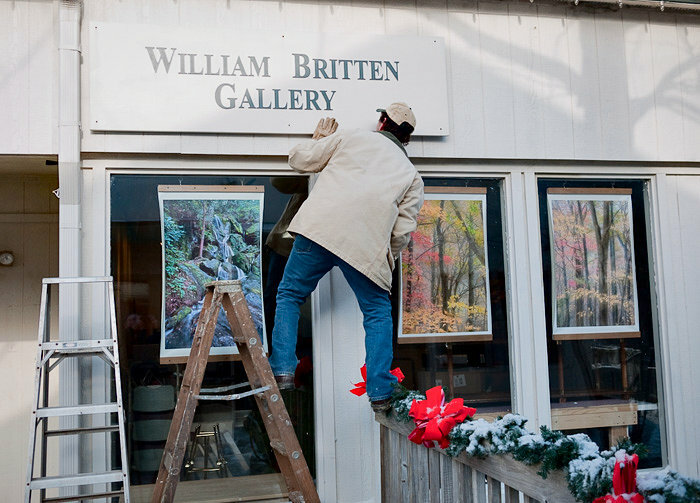 The William Britten Gallery of Smoky Mountain images is officially open at the new, expanded location. 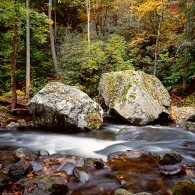 The gallery is located on the edge of the Great Smoky Mountains National Park in Gatlinburg TN. Look for me in the Morning Mist Village shops on the historic Arts and Crafts loop along Glades Road. Head out of Gatlinburg going east on Rt. 321. Proceed for several miles and turn left at the stop light just past McDonalds. My goal is to offer photographs that will cause you to feel the deep spiritual nature of these ancient mountains. 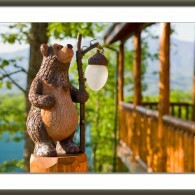 I want you to be able to take home with you an image that will recall the emotions of your visit to the Smokies. Each framed photograph is created in a way that is unique among photographers. Each image is given a treatment to enhance and protect the surface of the photo. Then the photograph is mounted on a board and framed without glass, much like a painting. The result is a stunning sense of being right there in the scene, or looking out a window with a fabulous view. The comments that I most often receive are that the images seem to glow from within, or that the photos have an almost 3-D appearance. You’ll have to come visit the gallery to see for yourself! 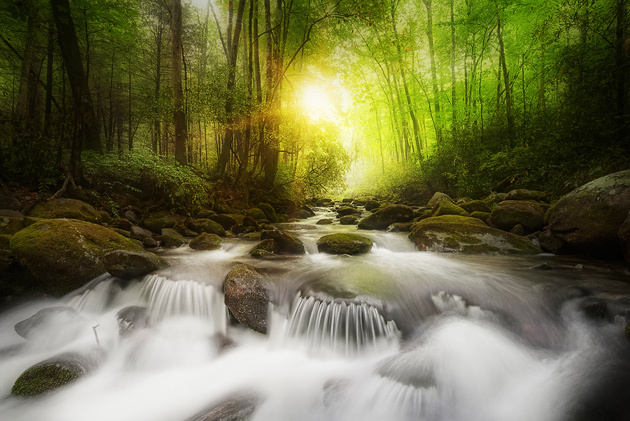 If you can’t make it to Gatlinburg, but are interested in details on images, sizes, frames, and cost, please visit my website by clicking on the Home button on the top right of your screen. Another dusting of snow last night, but finally some sunshine today revealed the full majesty of Mt. 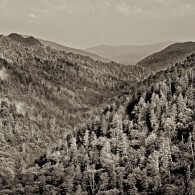 LeConte, one of the highest peakes in the Great Smoky Mountains National Park at 6593 feet. 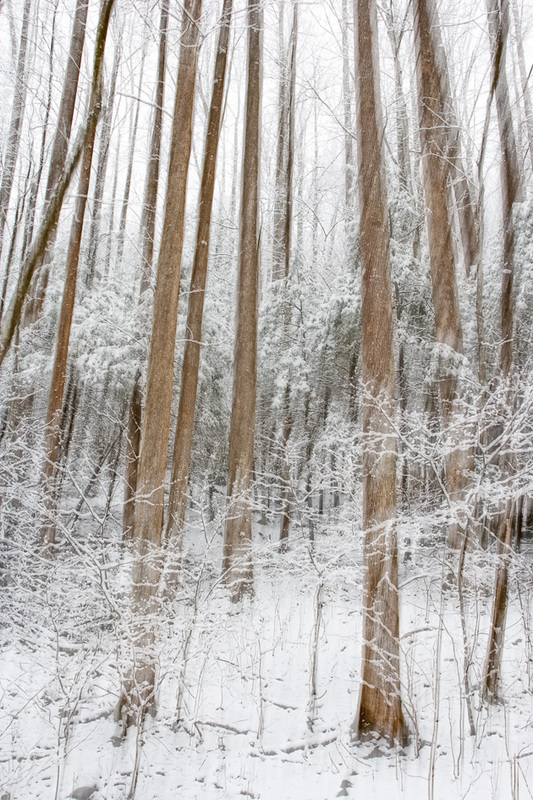 This is the view Sarah and I see every day from our little cabin in the Glades near Gatlinburg. Mt. LeConte has many moods and is shrouded in clouds more often than not. 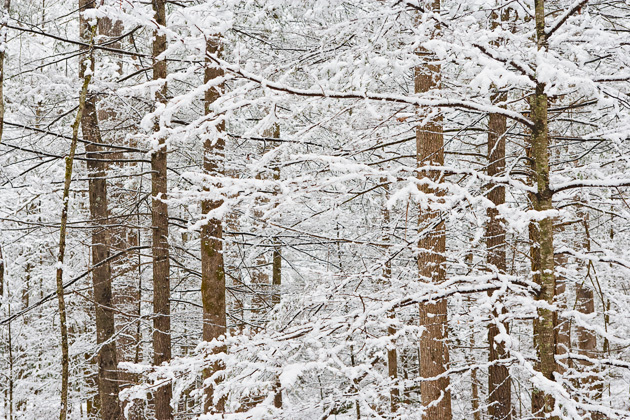 Weather down below can be mild and dry, while at the LeConte summit the snow is falling. 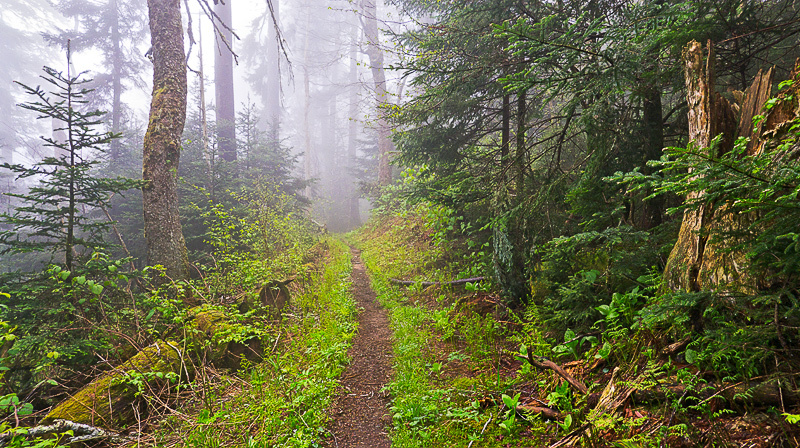 There are many trails in the Smokies that lead to the summit, and you can even stay overnight in a very rustic lodge. 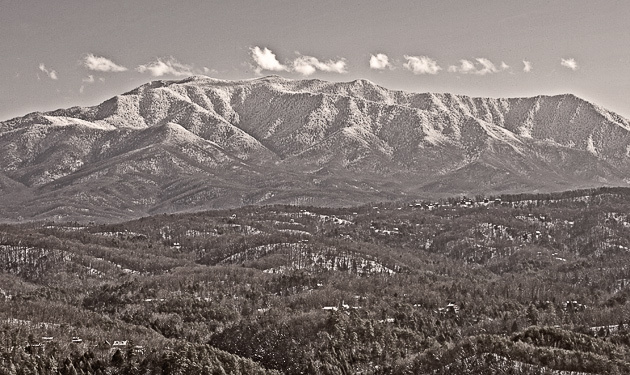 The mountain is visible from 30 miles away, and resort cabins line the ridges facing the Smokies. The image below was taken from about 10 miles away, high on a ridge. If you look closely you can see other cabins on closer ridges. 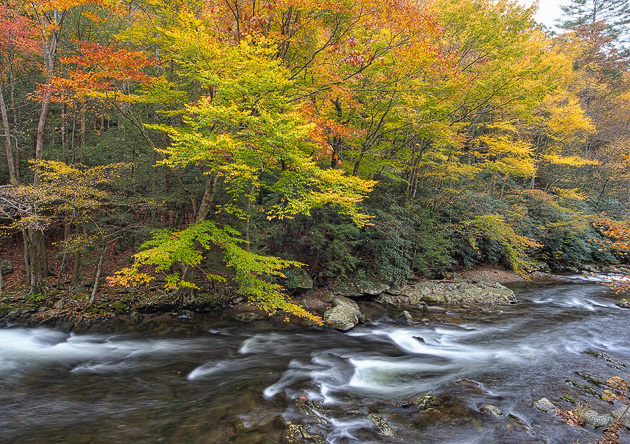 Another season begins along the Arts and Crafts Loop in Gatlinburg, Tennessee, near the Smoky Mountains. And there are lots of changes in store for the William Britten Gallery of Smoky Mountain photographs. 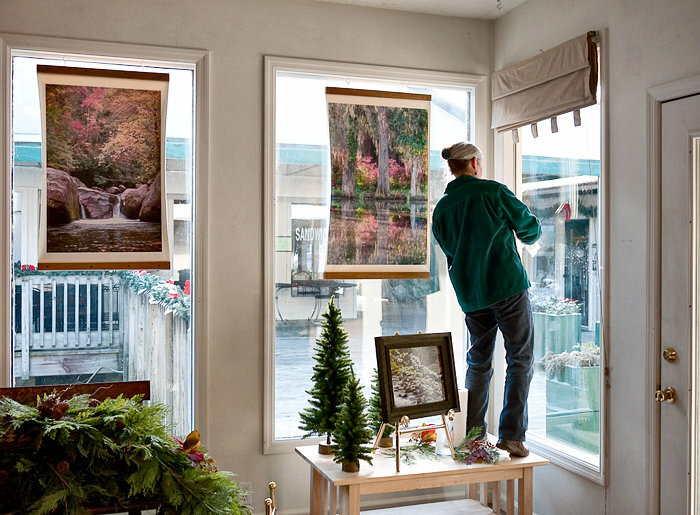 The gallery is moving to a new location, just a few doors down in the same Morning Mist Village shopping area. 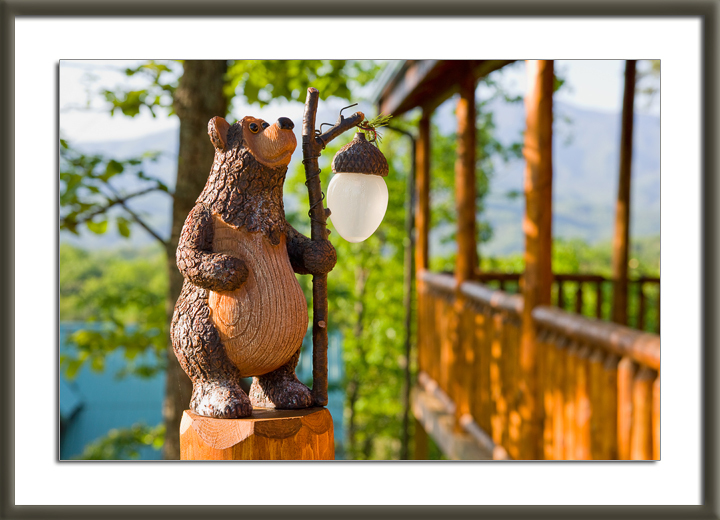 We’re moving to a larger space, and one that will allow me lots more room to frame my Smoky Mountain images and work on my resort cabin photographs. 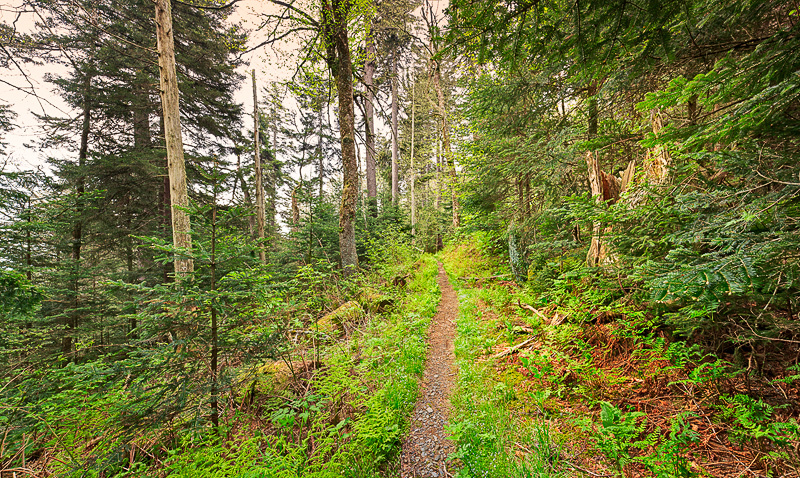 Hope to see you in Gatlinburg this year or along one of the trails in the Great Smoky Mountains National Park.